While crampons and footwear traction systems have not generally been considered a part of a hunting pack, they can be very useful in steep, wet, or icy terrain. Like having logging boots with instantly removable caulked soles, hunters can now use removable spikes to navigate nasty off trail conditions. In extreme locations where steep snow or ice is to be expected, a true 10 or 12 point crampon from Camp or Grivel is the most logical choice. 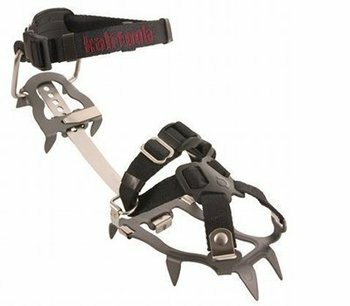 If use on very hard ice or rock is not expected, aluminum crampons can be a good choice. They are light (as little as 13-14 ounces), and very compact. Most hunters are more likely to encounter steep, wet, dead fall or frozen earth covered with snow. For these situations, a lighter steel spike system is ideal. They can be put on and removed quickly and easily, and offer the traction needed to travel more safely in steep terrain. Grivel and Kahtoola both make excellent options that lead the category, and range between 4.5 and 14 ounces.